On the morning of April 15, hackers turned the three round windows of building E25 into a traffic light. A post nearby had a walk button attached to it. Each time the walk button was pushed, the light would change from green to red, or from red to green. Several excited observers were seen to use this to play games of "red light, green light." When the button had not been pressed recently, the traffic light simply cycled through green, yellow, and red on its own. 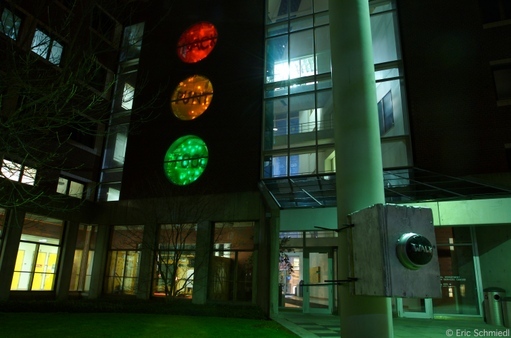 The red light was labelled "HACK", the yellow light was labelled "PUNT", and the green light was labelled "TOOL". In MIT jargon, to "punt" is to avoid doing work and to "tool" is to work studiously.